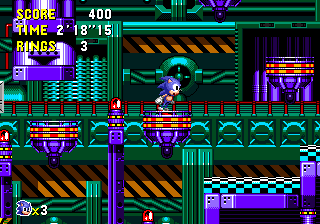 At first glance, it seems apparent that Sonic CD borrowed a lot of ideas for its level locations from Sonic 1, as the Green Hill, Labyrinth, Star Light and Scrap Brain Zones all have their own counterparts in this game. 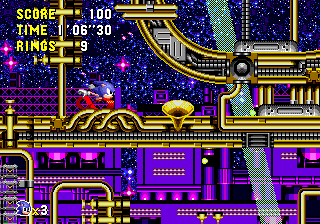 Burrow a little deeper into the multiple time zones though, a feature yet to be replicated in any other Sonic game, and you'll usually find whole new and imaginative locations, some rarely seen elsewhere in the series. While futures are mostly somewhat mechanical, pasts often have a prehistoric feel to them, or you can discover that factories and cities were once desert canyons or grand, ancient gardens. 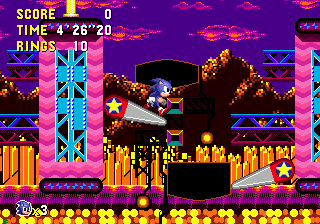 There are sometimes even sub-plots to give the levels more personality, such as the single large structure in Stardust Speedway that becomes a different building depending on the time zone, and thus Eggman's rule over it. Achieving a Good Future and seeing how the level will sort itself out in a pleasant outcome is always enjoyable. There really is so much to see, let alone do, in this game. 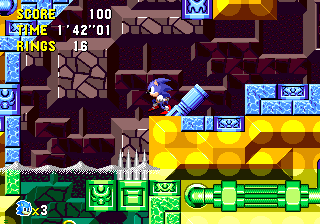 As I've mentioned, Sonic CD levels are not all about speed, but exploration. 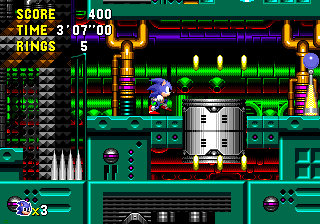 While other Sonic levels are designed so that they provide a continuous, fast-paced experience often across a wide area, without too much concern for wasted space on maps, Sonic CD levels are much more efficient in this way. Several routes are often crammed into one set space for any given zone, with few patches of unused areas, to allow for the maximum amount of hidden nooks and crannies. While you can still run through these paths fairly smoothly for the most part, you might find such an experience is a little shorter and less satisfying than the alternative Sonic games that specialise in speed and linearity. 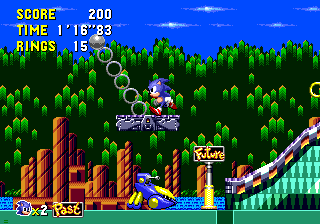 Because of the hidden objects you're encouraged to find, such as time travel posts, destructible machines, Metal Sonic holograms or even more rings for Special Stages, these smaller, but more complex level structures are a more suitable design, as they allow the player to be able to backtrack more easily than in a longer and more drawn out level. It's relatively uncommon for there to be any place in a zone that you cannot get to from any other point, at least in one particular time zone or another. This is ideal for offering plenty of opportunity to nose around and find the items you seek, and because of their horizontal size, going back and forth does not necessarily have to take too long. Across the different time zones, structures and objects do vary, but not to the same drastic degree that the appearances tend to. Exact structures of paths and the way in which they connect to each other tend to be the only differences, and this ensures that the time periods feel connected to each other and not like completely separate levels. Level exclusive objects are imaginative and numerous, particularly the clever use of two different types of most enemies; new and old. Bosses are quite unique in that they don't require the usual amount of eight hits during a consistent pattern. Eggman may only need one or two hits at a time to see him off, but actually earning those opportunities and enduring challenges beforehand are what these bosses are all about. To continue Tails' note, this isn't the first time either, as Sonic 3D Blast did the same thing, Green Grove Zone = GG, Final Fight = FF, etc. To Jay, this came befor Sonic 3d blast. A wonderfully bright and happy tropical paradise stage not at all unlike Green Hill Zone. Tonnes of springs will throw you around all over the place and you can spin through crazy winding tunnels or find secret passages in internal rock sections. The Past is a prehistoric jungle while the Good Future has water flowing freely, but the Bad Future is a polluted metal hell. A very short, simple stage that you can whip through with few problems. There are few other levels that can both charm and irritate you in such precisely equal quantities as "Star Light Zone on acid", better known as Stardust Speedway. Sonic CD's penultimate stage is by far its fastest, both in terms of top speed and consistency, with pretty much nothing but mind-boggling arrays of thin winding and curving roads, and lots of springs and speed-up devices to both send you on your way, and in the complete opposite direction. 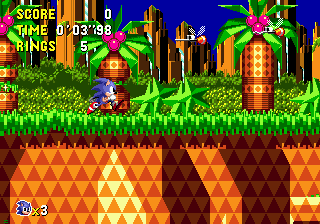 Zone 2 features a large background structure that alternates from Eggman statue to tall, beautiful buildings depending on the timezone, and the level culminates in a spectacular highway race against Metal Sonic to finally save Amy from his metallic claws. Collision Chaos doesn't have any 'druggy, psychedelic' look to it logically. It's just spotlights and rocks that have an orange tint to them. SS has a huge club/party going on in the back.